The Advisory Committee on Immunization Practices (ACIP), a group of individuals hand-picked by members of the Centers for Disease Control and Prevention (CDC), recommends which vaccines are administered to American children. Working mainly in secret, ACIP members frequently have financial links to vaccine manufacturers. Dependent on federal CDC funding, administrators of state vaccination programs follow CDC directives by influencing state legislators to mandate new vaccines. Federal vaccine funds can be denied to states that do not “vigorously enforce” mandatory vaccination laws. Conversely, the CDC offers financial bounties to state departments of health for each “fully vaccinated” child. In a recent year, the Ohio Department of Health received $1 million in such CDC bonus payments. At CDC national immunization conferences, Merck and other vaccine manufacturers wine and dine thousands of attendees who make their living promoting and administering vaccines. The American Academy of Pediatrics (AAP), a major supporter of mandatory chicken pox and other vaccine mandates across the country, shares incestuous financial ties with Merck. When constructing its new headquarters in suburban Chicago, the AAP solicited funds from Merck, and received $100,000 for its building campaign. Vaccines represent an economic boon for pediatricians. Profitable well-baby visits are timed to coincide with vaccination schedules established by the AAP and the CDC. As a front for Merck’s campaign to enact a chicken pox vaccine mandate, the company established and bankrolled the Illinois Children’s Health Coalition. Upon investigation, this group was found to be no more than a public relations gimmick. Merck’s similar campaign moved to Ohio with the introduction of a senate bill (SB 254). The senator (Grace Drake, R-Solon) who presides over the committee (Health and Human Services) hearings for SB 254 accepted significant campaign contributions from Merck. (Sen. Drake, at the request of a Merck lobbyist, had sponsored a bill in the previous year to mandate hepatitis B vaccine for Ohio kindergartners. To hide the legislation from the public, the mandate language was buried in a hazardous waste bill. The other hepatitis B vaccine manufacturer, SmithKline Beecham, lobbied the House Health Committee. In previous years, Sen. Drake opposed legislation to restore vaccine informed consent to Ohio parents. Despite a 94-3 vote in the Ohio House favoring informed consent, Sen. Drake refused to hold hearings on the bill [effectively killing the bill] after its assignment to her committee). Further, Merck consultant, vaccine patent holder and ACIP member Dr. Paul Offit of Philadelphia spoke at a recent American Legislative Exchange Councils meeting in Nashville. State lawmakers from around the country were treated to a well-rehearsed performance extolling the virtues of mandatory vaccination. Similar productions were staged during hepatitis B vaccine hearings in Ohio and Washington, D.C.
Who should make decisions about the vaccines & children—parents, doctors, legislators or vaccine manufacturers? That is the issue. 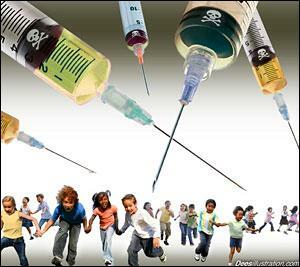 Special interests continue to push for mandatory vaccines for schoolchildren. Recently, in Ohio, it was the chicken pox vaccine (varicella). If the bill passes, chicken pox vaccine, manufactured in human fetal tissue, will be the ninth in the cocktail mix of vaccines required for school attendance. In Ohio, at the urging of vaccine manufacturer Merck, Sen. Bruce Johnson introduced SB 254, which mandates the vaccine for schoolchildren in grades K-12. Ohio marks only one of Merck’s latest efforts to require chicken pox vaccine in every state—a plan that would guarantee Merck annual sales of nearly $7 million for each new class of kindergartners in Ohio alone. From the medical and health-care cost perspectives, chicken pox vaccine is a loser. Two studies, one funded by Merck, found that only if lost wages are included for a parent to stay home with a sick child is there cost advantage to using chicken pox vaccine (JAMA 271: 375-381, 1994; J. Ped. 124(6): 869-874, 1994). The vaccine industry has corrupted government policy. It’s about time lawmakers say “no” to drug company lobbyists and “yes” to informed consent. This entry was posted in corruption, Government and tagged american academy of pediatrics, drug companies, lobbyists, profiteers, vaccine mandates. Bookmark the permalink.